The HP Spectre x2 2017 model has an elegant yet functional design and is a better competitor and replacement for Microsoft Surface Lineup. 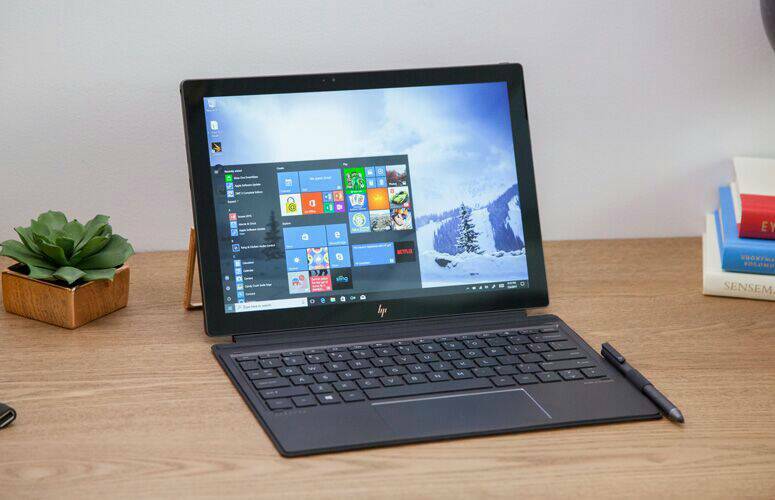 HP masterfully takes this detachable PC form factor and adds its design touches to give the Spectre its own distinctive look. Connectivity: 802.11ac, Bluetooth 4.2, 2 USB Ports: USB 3.1 with Type-C, Card slots, audio jack. The Spectre x2 is an attractive black and copper machined aluminium design with a dark ash silver finish. It has a kick-stand that could be manually moved to the desired position. It offers only USB Type-C ports, and the detachable includes a USB Type–A. Despite the fact that kick-stand based detachable don’t give good typing experiences on the lap, its kickstand is useful for drawing with the stylus. Its touch screen is excellent; it accepts taps accurately and quickly responds to Windows 10 swipe-in gestures smoothly. It has a 12.3-inch display packed in a 3000 x 2000 pixel resolution which equals 293 pixels per inch. This means there would not be any vague and dull appearance around texts and images. It looks good when viewing movies, and texts. Its display is bright enough to use outdoors, and under direct sunlight though there might be plenty of reflections. It features a 3:2 aspect ratio that makes it taller than the previous model widescreen and also feels more comfortable to work with as a tablet unlike the 16:9 aspect ratio. Its black and copper all aluminium aesthetics makes it look more like a high-end wristwatch than a PC. With its core i7 (7th generation) processors, the Spectre x2 is very speedy than any other PCs and capable of running many tasks at the same time efficiently. There is no lagging even during execution of large applications Its battery lasts about nine hours of use on a charge which is definitely better than last years model, but cannot be compared to Surface Pro that lasts 13 hours plus. It has one of the best keyboards, so far as typing with it feels excellent, comfortable and faster. The HP Spectre x2 keyboard platform utilises full-sized backlit keys with a stylish management. This backlight is not adjustable but can be toggled on and off. Below the keyboard is a full track-pad that provide sufficient surface to move your mouse. The Spectre x2 sound performance is outstanding and adequate. Concerning the HP Spectre x2 camera, it has a 3.6MP camera on the front and 9.4MP camera on the rear side. It also includes some useful tools from HP. Its price starts from $1,149 with this model that has a Core i7-7560U processor, and in Nigeria, the price is about #409,044 depending on dollar rate.